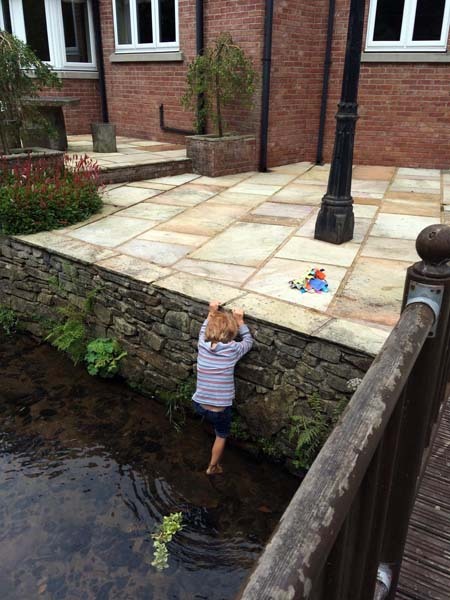 There’s a sweet little stream that meanders through our son’s back yard in England. 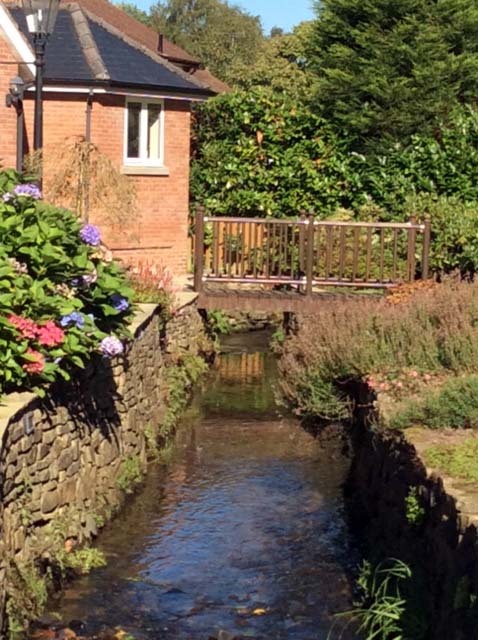 However, with two little boys living there, we call it “The Moat”. Every five-year-old warrior needs a moat to play in, especially if he doesn’t have a real dragon. Surely there are no bad guys able to breach this natural barrier! 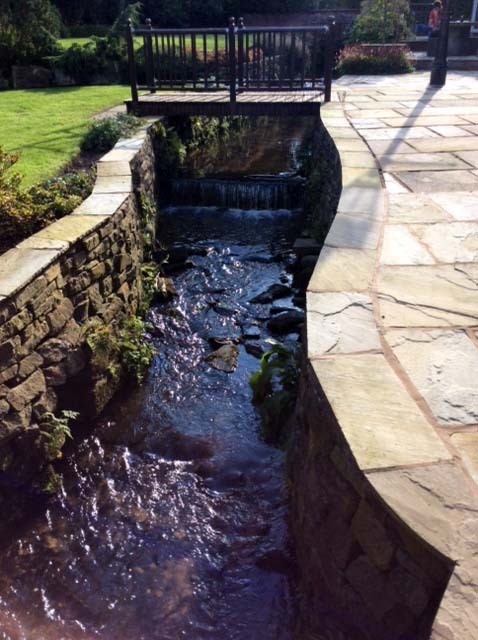 As I visited in the UK, I enjoyed sitting in the sunshine on their patio and listening to the water flowing over the stones. Although one day I wasn’t quite so happy with “The Moat”. I was working on a project for Nikki, and a quick gust of wind blew a full box of Mr. Clean Magic Erasers (which we couldn’t find in any grocery store in the area) right off the table and into the water! The erasers were gone in a wink to who knows where; although Matty was sure he saw it in the port at Liverpool a couple days later. (Note to self: Add Magic Erasers to the “send to the kids” list). Fortunately it didn’t overflow its banks, and as much as he wanted to run outside and check things out, our little warrior had to stay inside where he was safe and dry. I’ve always enjoyed being near the water, whether it is experiencing the crash of the surf next to the ocean, the gentle lapping of waves of a lake, or the trickle of this stream — I find the sound of water both soothing and exhilarating. It is fascinating to me to ponder where the water in this stream came from and where it is going and also that I am never seeing the same water; every moment the water is fresh and new. It’s interesting that Jesus uses flowing water as an analogy to help us understand how he works through our lives to bless others and accomplish his plans. The thing about rivers, or streams, is that they are constantly flowing, they flow around obstacles, they widen out becoming barely a trickle, or they may spill over their banks. Even when they are dammed up, rivers just get deeper and deeper until they flow again over the top of the dam. You can’t stop them. So should it be with us, there should always be evidence of Jesus living in us. Our lives should always be a source of blessing to others as the river of the Spirit of God flows through us. 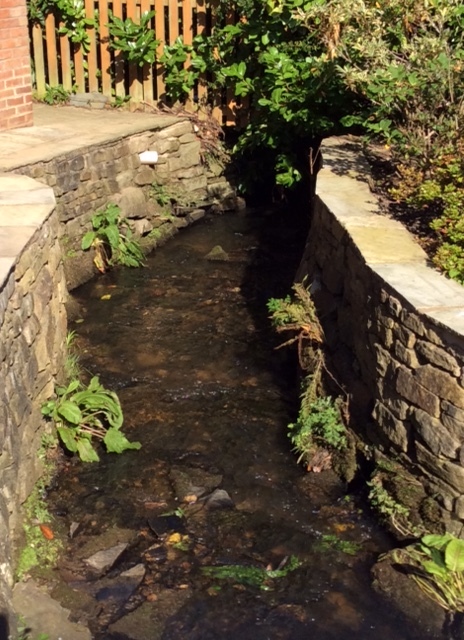 Like the stone walls of this little stream, we are not the source of the water, nor do we know to where the water is flowing, our responsibility is to be the channel through which the water flows. Our job is not to tell the water what to do, where to go, or what it should accomplish. Our responsibility is to keep the path clear so that the water can flow more readily. We do this by maintaining a clear conscience before God, confessing and repenting of sin, and choosing to live in obedience. In my son’s backyard, someone built the beautiful walls along this stream. The circumstances of our lives are the walls that direct the path of the living water that flows through our lives. The beauty of our circumstances is that God has allowed, and is allowing, every stone that is there. There is no circumstance that God has not personally put in place in your life for his good purpose. No matter what our circumstances may be, we must never let self-pity, doubt, fear, worry, anger, unforgiveness, bitterness, envy, discontent, or longing for change to inhibit the flow of the water through us. We must keep our hearts and minds focused on Jesus who is the source of the water. No matter what role we have as we serve for the cause of Christ, it is the living water flowing through us that blesses the lives of others and accomplishes the purposes of God. How readily does the living water flow through you? Are there obstructions: boulders created by issues only you are aware of? Are there piles of debris from unconfessed sin? Or do you regularly feed the flow by pouring in and applying God’s Truths and promises? Thanks, Marcia. Last night I finished 10 years serving on our board. This is new territory for me. Its is a good reminder that His water flows through me no matter where He places me next. Love the pics of your visit! What a beautiful backyard. Enjoy! Amen! Thank you, it was a great visit! Thanks Marcia, I love water too, especially clean, pure delicious tasting water to drink! I appreciated your devotional and the questions to ponder reminded me of BSF lecture questions. I’m glad to have you share what the Lord is impressing on your heart and the pictures of the mote and other pictures you included; they were lovely! Sandy C.